“Prime Minister Theresa May has survived another debilitating day ‘in the Brexit trenches’ after ‘Leave’ Ministers David Davis and Boris Johnston dramatically resigned from her cabinet over what they saw as further dilution of Britain’s negotiating position with the EU. As the Brexit conflict continues to ravage her Cabinet, her Party and her political Union it looks increasingly likely, as the Scottish Socialist Party has forecast from the outset, that Britain’s formal departure from the EU next March will result in little difference from present arrangements with the EU. And this is precisely what big business both here and Europe has wanted all along. At tonight’s weekly meeting of the Conservative 1922 Committee – of rank and file Tory MP’s – only 4 dissenting voices were raised over May’s plan. Indeed a ‘prolonged show of party unity’ was apparently orchestrated by loyalists. The Tories view that ‘hanging together is better than hanging separately’ was best expressed by the 1922 Committee Chairman Graham Brady MP who insisted ‘Backbench Conservative MP’s are to be congratulated for showing more unity, loyalty and discipline’ than their Cabinet colleagues. 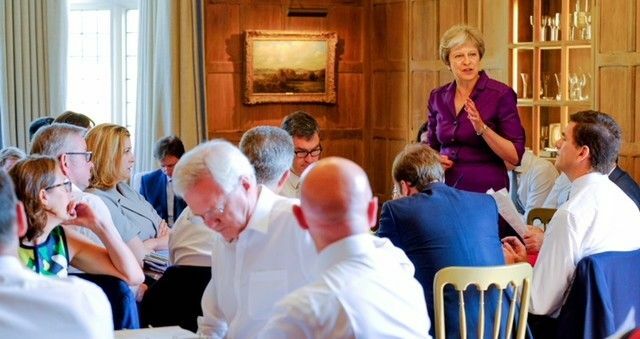 Others were less enamoured and described the deal hammered out by May at Chequers this weekend as a ‘Remain coup’. Despite frenzied media speculation however it looks unlikely May will face either a leadership challenge or a vote of No Confidence in Parliament. Formally independent of the EU but to all extent and purposes still covered by its rules, regulations and treaties May’s plan for Britain was thus criticised by Davis and Johnston.